When I was a young boy my Mother would sometimes suggest going for a walk or a bike ride. Our 'long route', only achievable by bike, was 'round Byley' but, if we wanted a shorter ride, or a walk, we would go 'down the factory lane'. Finney's Lane, in those days, was an isolated spot at the end of Webb's Lane, dominated by the British Crepe Factory, known simply as ' the silk works'. The silk works was a vast, sprawling, industrial complex which loomed over the Big Lock pub like a brooding giant. It started life as a condensed milk factory and opened as a silk works in July 1931. Ten years later, during the second world war, its roof was set alight by incendiary bombs*. The factory has now been replaced by up-market housing. The 'factory lane' was reached by one of two ways. You could get there by going 'down Bill Hewitt's', the pathway that ran from King Street across the site of old salt workings to a point close to the Big Lock, and then crossing the footbridge which still stands at the end of the lock itself. Alternatively, the pathway which runs down from King Street alongside Harbutt's Field to reach the same point could be used. Once Webbs Lane, the Big Lock and the silk works had been left behind, Finney's Lane took on a rural aspect, reminiscent of the country lanes found all over Cheshire,and one had a feeling of being 'out of town'. Thick hedges flanked the road on both sides, relieved only by an entrance to Middlewich Athletic's football ground on the left hand side, shortly before reaching Middlewich Cemetery. This entrance was rarely used, usual access being from Seddon Street off Webbs Lane, which gave the ground its appropriately Middlewichian name. Once the cemetery itself was reached, a left turn into Croxton Lane led back to Chester Road and the hustle and bustle of Middlewich. 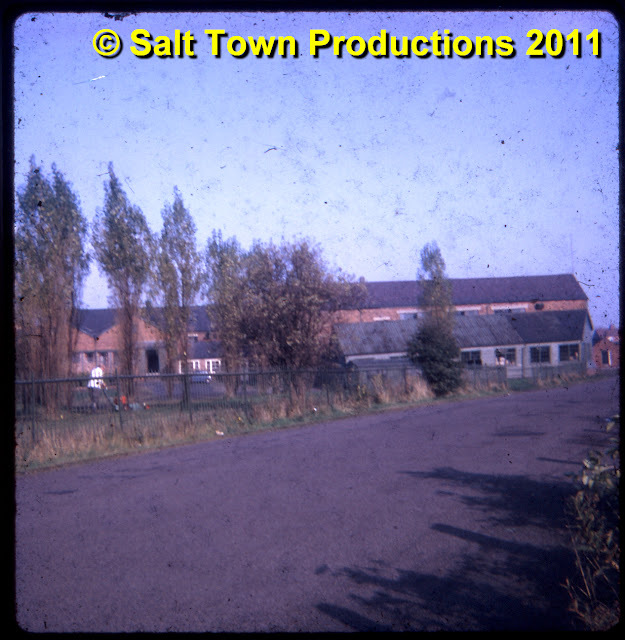 The original Kodachrome slide showing Finney's Lane in 1968 and looking towards the Big Lock, which is hidden behind the factory buildings. The alignment of the road has changed over the years and it now heads straight towards the pub rather than veering off to the right as it did back then. 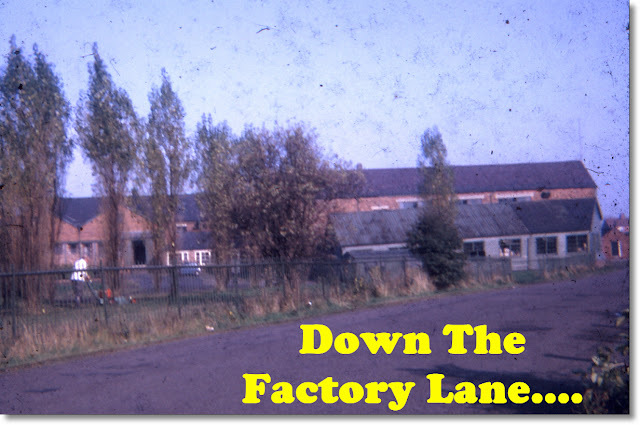 I was born in Webb's Lane, and my Mum worked at the factory both when it produced milk and when it was the silk works. We had a massive party in the canteen on Coronation Day for all the kids in the lane. We called Harbutt's Field 'Harvest Fields'* in those days, and we kids used to cross it for a day out by the River (Dane). We were on our own - no parents in tow... My Gosh! Health and Safety gone mad! But we survived! *Sheila is quite right. In former days 'Harbutt's Field' was always called 'Harvest Field' or 'Harvest Fields' by most people -Ed. When we lived in New King Street, 'Billy Hewitt's' was our playground. We found lots of Roman pottery at the south end of the field. Everyone called the main pathway 'Harvest Field' at that time. I remember the old deserted bungalow at the bottom of the 'Stone Houses' hill alongside the River Croco. We called it the 'old woman's house' and it was our den. Does anyone know the history of the house? I was raised in Webb's lane and remember this well. I was born 1868 and as a kid would pop across Newton Brewery for pop and nip the shop at other end of rd for half penny sweets. The area was lovely then not many cars and kids playing in the Street. I can remember the silk mill or as we called it crepe factory the fire there was a very vivid memory. Nice someone else remembers this arena as it used to be.